In homemade how-to number 7, I showed you how to make roasted garlic that you can put in or on practically anything. 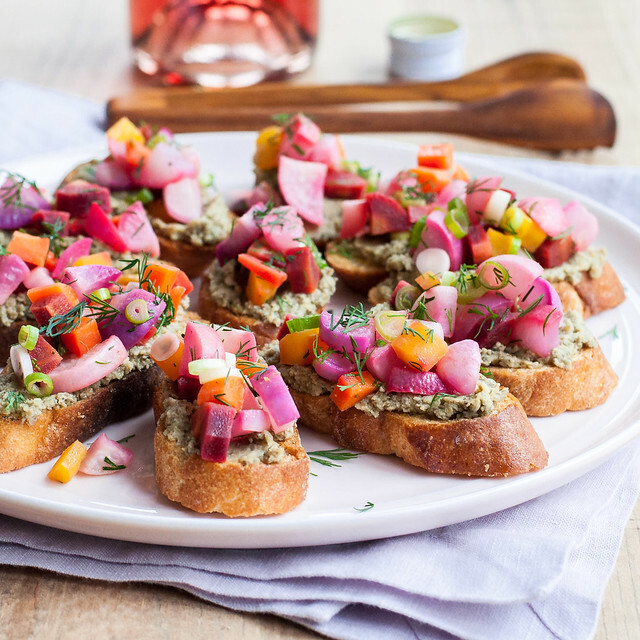 For example: roasted garlic lentil dip, to eat on veggies, with a spoon, or on these vibrant vegan spring bruschetta! My hosting style is a weird mix of fancy and informal. 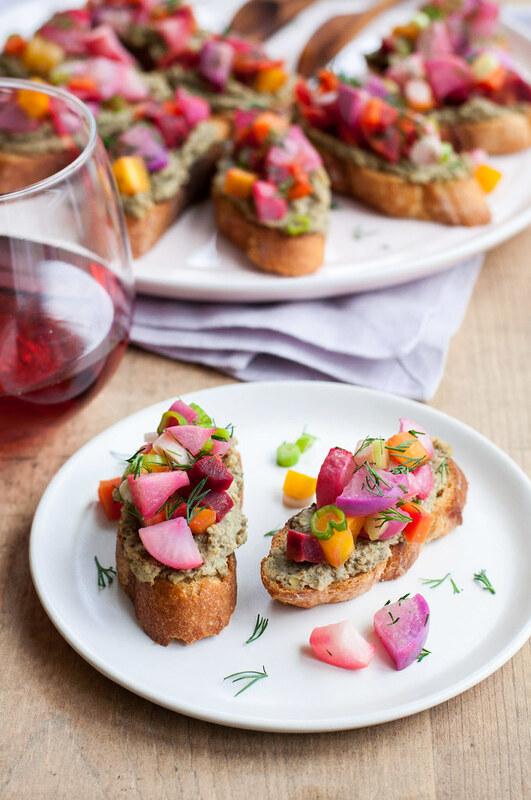 On the fancy side, I serve foodie-sounding, homemade appetizers like roasted garlic lentil dip in pretty white ramekins or maybe even a dip tray, surrounded by carefully chopped crudité, neatly stacked whole wheat water crackers, or sometimes, sans ramekin, atop garlic bruschetta topped with a pastel mix of roasted spring veggies. On the informal side, the eating often happens on the couch or with me entirely absent, as was the case last Friday. And, ummmm, the police may have been involved. THAT’S how good this lentil dip is. It should be illegal (except not). The plan last Friday night was to celebrate my littlest sister’s birthday over a fiesta, complete with enchiladas, green rice pilaf, festive black beans, and most importantly, margaritas and chocolate cake. My dad was in town from Minnesota, Steve’s parents planned to join the party, and all I had to do was run (or drive) the 20 minutes to the train station to pick up sister and husband as their train pulled in from NYC. Easy enough, right? I had most of the food prep done, husband and Dad were out for a bike ride, and my in-laws had just walked in the door. A little earlier, I fixed a quick plate of crackers and leftover lentil dip (from this photo shoot) to hold us over until the guacamole started, and I welcomed everyone to it as I ran out the door with the puppy. Fast forward 35 minutes. I had a car full and we were well on our way home, when a certain officer decided to ruin his Friday night. He pulled us over for a quite expired registration, since my city lacks the courtesy to forward important DMV-related mail when you move, as most residents in this commuter town do often. I was informed that I literally could not even drive the vehicle and must have it dramatically towed home. All I have to say is thank goodness we had an entertaining pug with us, because it made the hour and a half wait for the tow truck pretty painless on my part, except for the delay in marg consumption. Our law-enforcing friend, however, seemed none too pleased that his routine last nab on the way to end his shift turned into such a lengthy ordeal involving horn honking by many angry rush hour commuters on the major roadway he was obnoxiously blocking. Upon our return home, that little lentil dip snack (and several other items in the fridge) had been graciously devoured, mostly by my ravenous post-ride Dad. We didn’t waste any time getting margaritas shaken up and enchiladas into the oven, snacking on guac and some seriously spicy green chile salsa in the meantime. One little hiccup didn’t put any hiccups at all in celebrating Baby T’s big 27! Next time, though? 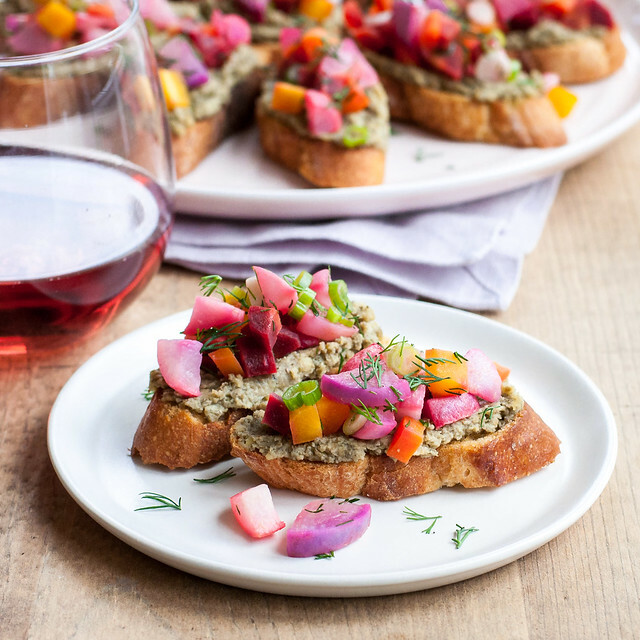 I’ll probably opt to avoid any contact with law enforcement, slather roasted garlic lentil dip all over crunchy bruschetta, and enjoy them on the formal (and more organized) side with a glass of rosé in hand. 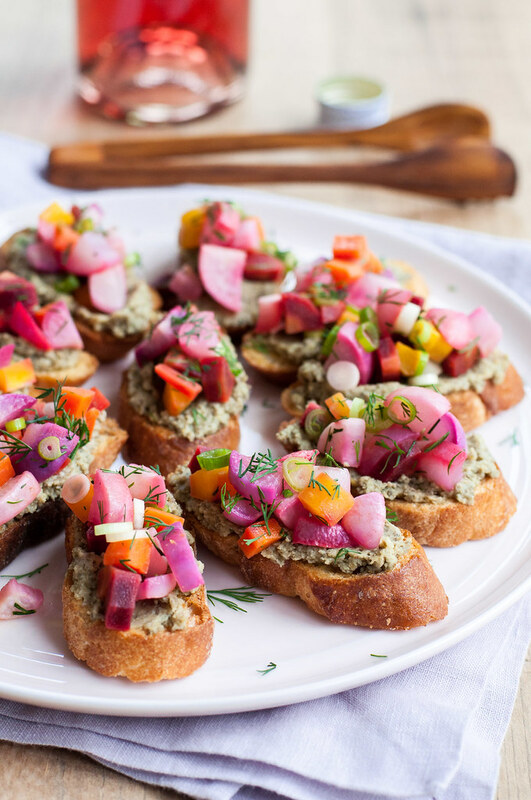 Scroll down just a bit for the full bruschetta recipe! A few simple steps help this hummus-like dip to burst with flavor: roasting the garlic, boiling the lentils with a few aromatics, and using your favorite olive oil. In a medium saucepan or Dutch oven, heat ½ tablespoon oil over medium heat. Add onion, celery, carrot, dried herbs, bay leaf, and a generous pinch of salt and pepper. Cook until vegetables are just softened, about 10 minutes, stirring occasionally. Add lentils and stir often for 2 minutes to toast. Add wine, adjust heat to a simmer, and cook until wine is almost evaporated. Add stock or water and increase heat to a boil. Reduce heat so lentils simmer gently and cook until tender, about 25 minutes. Cool the lentils slightly in any remaining liquid, remove the bay leaf, then transfer to a food processor with the roasted garlic and lemon juice. Puree until nearly smooth. With the machine running, drizzle in remaining ½ cup olive oil. Taste and adjust seasoning with salt, pepper, and more lemon juice. Serve warm or refrigerate up to a few days, then serve cold or room temperature. Recipe lightly adapted from Bon Appetit, April 2012. Prep and cook time does not include roasting the garlic. You can do this ahead of time and store it in the refrigerator or freezer. See this page for all the details. 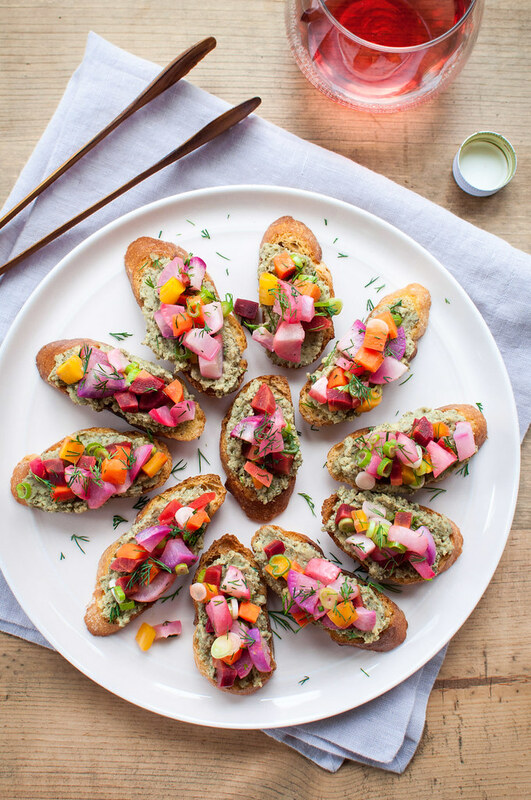 Make the most of colorful, short-lived spring produce with this pretty appetizer! It would be perfect for drinks and snacks before heading out to dinner, or as part of a cocktail party buffet. 4 carrots, preferably of mixed colors (I used orange, purple, and yellow), peeled and diced ¼"
1 bunch radishes (about 8), diced ¼"
To make the toasts, slice the baguette diagonally ½ inch thick. Preheat oven to 425 (F) and spread baguette slices in a single layer on one or two rimmed baking sheets. Brush both sides of each slice with olive oil (or use olive oil spray if you're in a hurry) and sprinkle with salt. Bake about 8 minutes, rotating pan(s) halfway through, until medium golden brown. When still warm, but cool enough to handle, rub cut side of garlic clove on one or both sides of each toast. Set aside to cool completely, then store in an airtight container up to two days. On a rimmed baking sheet, toss carrots and radishes with olive oil to coat, then sprinkle with salt and pepper. Bake (in the 425 degree oven) for 15 minutes. The vegetables should be tender but barely browned. Once cool, transfer carrots and radishes to a bowl with scallions, lemon juice, fresh herbs, and additional salt and pepper to taste. 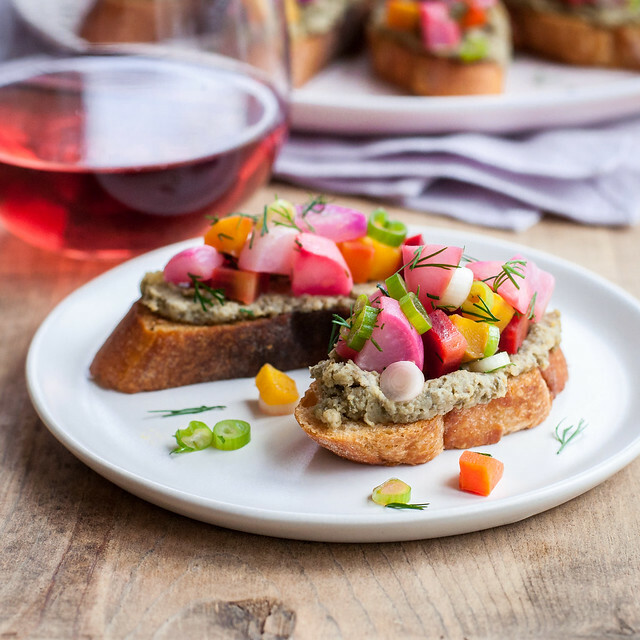 To assemble bruschetta, spread each toast with a thick layer of lentil dip, a spoonful of vegetables, and extra fresh herbs for garnish. Serve warm or room temperature. Note: This page contains affiliate links. It does NOT contain sponsored content. Affiliate links (to products I recommend, on Amazon) offset my ingredient and website maintenance costs, so I can keep bringing you seasonal recipes like this one. Thanks!